Acer's latest batch of Swift and Spin notebooks are the company's lightweight and powerful options to take from the home, to the office and back again. They're also designed to offer good value for money, and one of their top offerings in that regard is the 2018 Swift 5 notebook. It costs a recommended R13 999 (less than a new Galaxy S smartphone) and sports a number of enviable components and features. At 956 grams it certainly ticks the box as far as lightweight design goes, but how does it fare as an all-round notebook? I recently put it through its paces to find out how the Swift 5 performs. 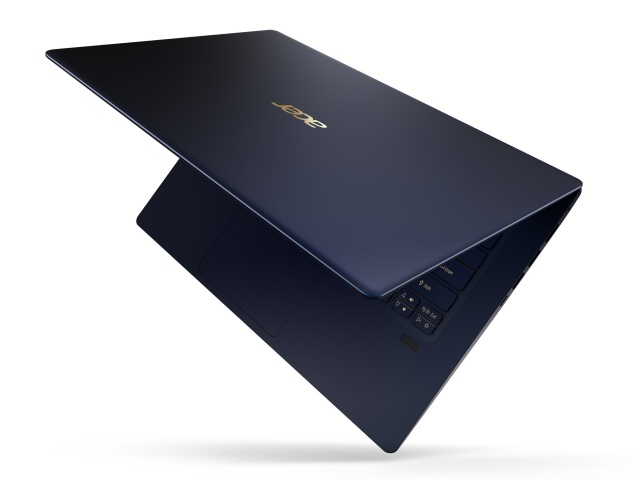 Before delving into the different elements that Acer has opted for in the Swift 5, it is worthwhile mentioning the lightweight design of this particular notebook. Only tipping the scales at 956 grams, one actually needs to hold the Swift 5 in hand just to feel how light this device is, which is made even more impressive given its 14" Full HD (1920x1080) display and two-cell 4670 mAh battery that's housed in the 14.98 mm tall aluminium body of this notebook. As such, for users in the market for an ultra lightweight notebook, the Swift 5 is a good option based solely on its dimensions. It could also serve well as a secondary device, should users not wish to lug around a heavier machine or require computing capabilities on the road when their desktop PC is not in reach. The battery setup onboard the Swift 5 yields an approximate eight hours of usage, according to Acer. I found that this figure is pretty much spot on, with the battery life taking a slight dip to around seven and a half hours when the display's brightness is put on 100% or the Swift 5 is made to handle a heavy amount of multitasking. While more powerful notebooks normally aim for 11 hours of use, the Swift 5's capabilities should be able to manage a usual work day (9:00 to 17:00), but may be best served as a secondary notebook if battery life is a key consideration for you. 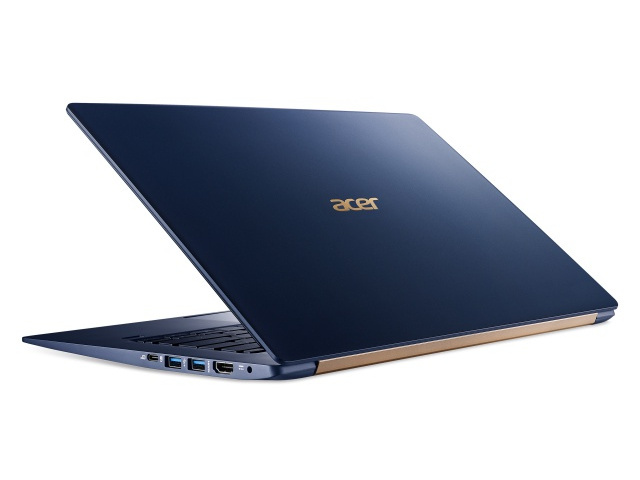 Another notable element of the Swift 5 is its design, with Acer opting for an eye catching mix of dark blue and gold. It may not be everyone's taste, but is certainly a welcome change from the usual options of titanium silver or carbon black. To match its design, Acer has decked out the Swift 5 in solid components and ports. The aforementioned 14" display is bright and crisp, handling sunlight glare well and yielding enough image detail for users that want to watch hours of videos and movies. It also supports multi-touch functionality, but I found myself less inclined to reach for the screen, primarily as the Swift 5 does not have a display that swivels to be put in a Tent or Tablet mode. The keyboard and trackpad have a premium feel, with the former providing a satisfying amount of feedback while typing and the latter responding quickly while scrolling or editing images sans mouse. When it comes to ports and connections, the Swift 5 has you covered. A USB 3.1 Type-C connection is available, with two USB 3.0 and HDMI output present too. 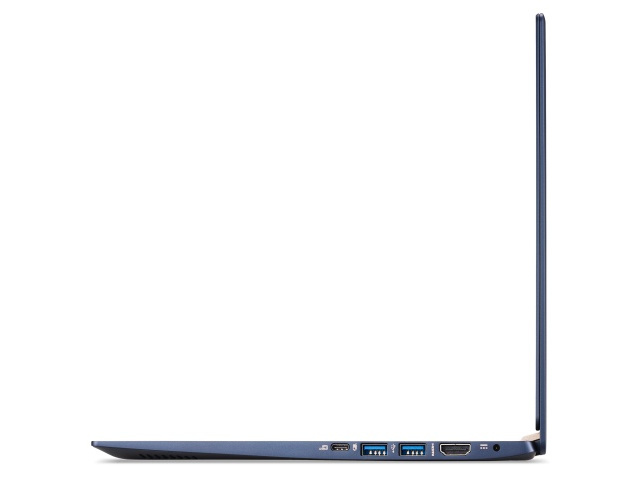 As such, for an ultra thin and lightweight notebook, the Swift 5 is well appointed given its R14k asking price. Now for the one element that proved a touch underwhelming with the Swift 5. Powering this device is an Intel Core i5 (8250U) processor, which is paired with 8 GB LPDDR3 RAM and a 256 GB SSD. On the whole the setup is solid, offering a relatively speedy performance while multitasking, with a couple of caveats. The primary issue was the noise, as well as the heat that radiates from the Swift 5 while it's being put through its paces. Running multiple processor-intensive applications appears to be putting a bit of a strain on the Swift 5, and bumping things up to the i7 processor sporting model may be option in the long-term. As such, in the next three years, the Swift 5 may not be up to snuff when compared to the other 14" ultra light notebooks that enter the market. Consequently, the Swift 5 cuts the mustard for now, but may not be the great option it is now come 2020. The only thing I had an issue was the choice of processor, with the i5 option available on my review unit feeling a tad underpowered. Instead the i7 model (listed on the local Acer store for R18 799) of the Swift 5 should prove a far more compelling all-round notebook.